FDA-Approved DHT Blocker for Women? We always hear DHT is the main cause of hair loss, but we rarely hear why it happens or how to fix it. This article will give you a brief overview about DHT and how to stop. DHT comes from testosterone. Although testosterone in its normal form doesn’t cause hair loss, once it is converted to DHT (dihydrotestosterone), the trouble begins. Think of DHT as a hair follicle terrorist. 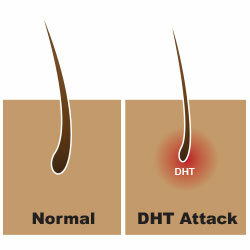 Once DHT exists inside the scalp, it starts attacking the root of a follicle (aka dermal papilla), which normally receives essential nutrition from our body for healthy hair growth. Over time, as DHT continues to attack hair follicles, they finally give in and start shrinking (see more reasons for hair loss). This interruption of the normal hair growth process causes hair to be very thin and brittle. Unfortunately, there is no FDA-approved drug classified as a DHT blocker for women, but that does not mean that you should give up. There are a number of foods that are effective at inhibiting DHT production by preventing the conversion of the enzyme 5a reductase. Some of these include green tea, nettle tea, flaxseeds, saw palmetto and soy.